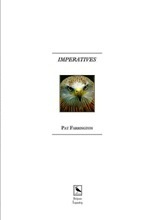 The 24 poems in Pat Farrington’s Imperatives span continents, moving between Europe, West Africa and Polynesia, while maintain-ing a strong focus on the natural world, our membership of it and relationships with it. This makes for some intense and beautifully-observed imagery (for instance, I loved the poppy’s “stamens curled like sultans’ turbans” in ‘Dynamo’). On occasion though, the wealth of descriptive detail becomes overwhelming and threatens to drown out a poem’s effect. There were some where I felt a need to stop to draw breath. but still jolting me in the guts. Although the poet is often present, witnessing these scenes, I sometimes found myself looking for more sense of her own connection to what is described so carefully. Where this is achieved in a few words, as in ‘Custodian’, the whole poem becomes more effective. Digging in an allotment, the narrator starts to feel protective of a newly-planted sapling, reflecting on the possibility that it may not survive. In the regretful phrase “no leather-clad seeds to start again” I sensed a subtle allusion to the poet’s own feelings of impermanence. five times until he moves and cries. London Grip Poetry Review – Lee	Richard III, Arcola Theatre. Review by Barbara Lewis.